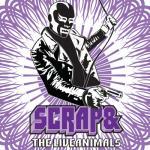 Sign up for Broadjam today to follow Scrap & The Live Animals, and be notified when they upload new stuff or update their news! An epic song about Human evolution and the african diaspora. Heavy guitars and drums help lace this track with an energy rarely found in songs with substance. A must hear Classic that rivals the likes of Nas and Tupac combined. I am foot, I am hand, I AM HUE-MAN!!! I am who I am...I am HUE-MAN!!! And no I am not Perfect. But I was born here to live Life on earths surface. I am HUE-MAN. I am HUE-MAN!!! 2nd Vs.: They filled the cup with hatred, I never took a drink. I stared death in the eye- and never took a blink. Sold from my tribe, I overcame the chief. I overcame the journey in the belly of the ship. I overcame the post. I overcame the whip. I overcame the selling of my daughters and my sons. They threw me in the fire so I danced on the SUN!!! 3rd. Vs.:They flung us in the cold. Beat and raped my wife. But we still wrote the words of our souls on the ice. Poked holes through the foil, sung through the jars. I listened to the rocks. Broke away the stones. With my strength I tore chains and I returned to his throne. I am heavens destiny. I What you think i stayed for? The Worlds on my shoulders....cuzz thats what they were made for! And I can slay giants whenever I get the urge! I am the original....Man of all men. I am him...with diamonds glistening in my skin. I ride the earths spin. Tango on the wind. Even when I lose you will C that I do win. You are what he saw when he said that it is GOOD!! !